(Mar 11) - Mauro Dimitri, head of the World Federation of Urology, has announced the creation of the "super-tomato," officially called the "Maxantia" (pending registration of the name). It is the work of the Biomolecular Institute at the Naples National Research Center. The announcement stresses that the Manxtia is not a genetically modified product, but rather a blend of two existing varieties: the San Marzano, well-known for its anti-inflammatory properties, and the Black Tomato, a purple fruit high in anti-oxidants. According to Dmitri, the Maxantia "...has nutritional characteristics ideally suited for preventing disease...[and has]...anti-oxidant activity superior to all other tomato hybrids...[making it]...suitable for defending against prostate cancer and reducing the risks of many other diseases in which oxidative stress and...free radicals play a role. These include cardiovascular disease, arthritis, Parkinson's Disease and osteoporosis..." Campania regional authorities are now encouraging local pizza makers to use the Maxantia as an alternative to regular tomatoes. The role of deep drilling at this area is...crucial. It could give a fundamental, precise insight into the shallow substructure, the geometry and character of the geothermal systems and their role in the unrest episodes...as well as to explain magma chemistry and the mechanisms of magma-water interaction...Since Campi Flegrei is a typical example of collapse caldera, the inference about its substructure, thermal state, magma chamber and geothermal system will allow a considerable scientific step towards the understanding of one of the most peculiar and potentially catastrophic volcanic areas of the World. 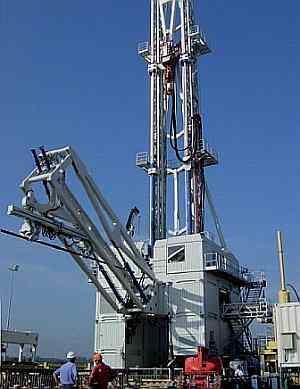 Drilling will employ the most modern drilling equipment, the Innovarig (photo), designed by GFZ German Research Centre for Geosciences in Potsdam, Germany and built by Herrenknecht Vertical and H. Angers’ Sons. 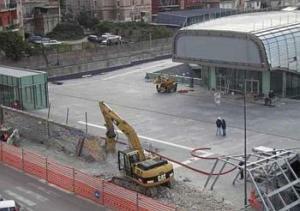 The first work will be off the premises of the old steel mill in Bagnoli and will bore down to 500 meters. 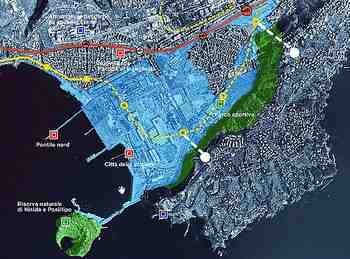 Later exploration will branch out onto the center of the Gulf of Pozzuoli and reach a depth of 4 km. (Mar 17) - The Italian Merchant Marine Academy opened in November of 2005 in Genoa. Before that time, many of the officers aboard Italian merchant vessels had received training elsewhere or, themselves, were foreigners. It does seem fitting that Genoa, the birthplace of Columbus, should have been chosen to fill this enormous gap in Italian maritime activity. Now, the Academy has opened a second campus in Torre del Greco, a suburb of Naples, an area that handles 40% of Italian merchant shipping. The academy is free to students, and the new facility near Naples seemed perfect since the area has always had a strong tradition of young men "shipping out." Strange thing, however—of the 20 students who will start courses in Torre del Greco in the autumn, none comes from Naples or, indeed, anywhere in the Campania region. Most are from Sicily, with a few from Puglia, Tuscany, Sardinia, and even Liguria (the regional capital of which is Genoa). But none from Naples. (Mar 23) - “Agricultural archaeology” is a relatively new term—at least to me. It means the study of crops that have been typical of an area through the ages in order (1) to better understand the history and culture of the area, and (2) to help sustain biodiversity. 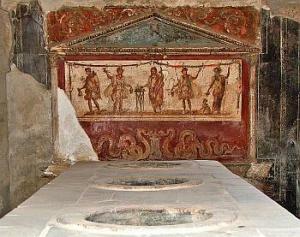 In the local area, for example, it is of interest to us to know what the Romans of Pompeii ate. In some cases, they ate the same things that modern residents of the area eat—the lunga di Sarno, for example, a hazel nut characteristic of the areas around Vesuvius for at least 2,000 years; also, Cato and Columella both spoke of the cabbages and onions of Pompeii. A convention has just been signed in the presence of the president of the Campania region, Bassolino, and the regional clerk for agriculture, that will protect the lunga di Sarno as well as other species of agricultural crops typical of the area. “Protect,” here, includes encouraging local farmers not to desert traditional crops. (Mar 23) - Susana, Lady Walton, passed away on March 21, 2010, aged 83, at La Mortella, the garden paradise she created on the island of Ischia many years ago. She created, as she said, "a garden for an artist," and then, later, through the creation of the William Walton Foundation, dedicated the premises to the memory and music of her husband, William Walton. Lady Walton was energetic and gracious and will be remembered fondly by all who ever came in contact with her. Her ashes will rest near those of her husband in the Upper Garden, the highest point of La Mortella. Rest in peace. —The youngest grandmother in Europe is a Neapolitan. She is 29 years old. —Someone in the papers is concerned about the weed garden growing on the roof of the Royal Palace. Seeds blow in and take root and every year at this time the RP starts looking like some sort of Gaelic thatched house. 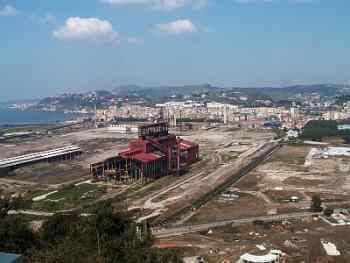 —In Bagnoli, money has finally been appropriated to convert whatever that ex-steel mill building was (photo, right) into the long-awaited Industrial Museum; also, there is money for an aquarium. —Rain water is leaking into the famous Catacombs of San Gennaro, putting a number of precious paleo-Christian art works at risk.